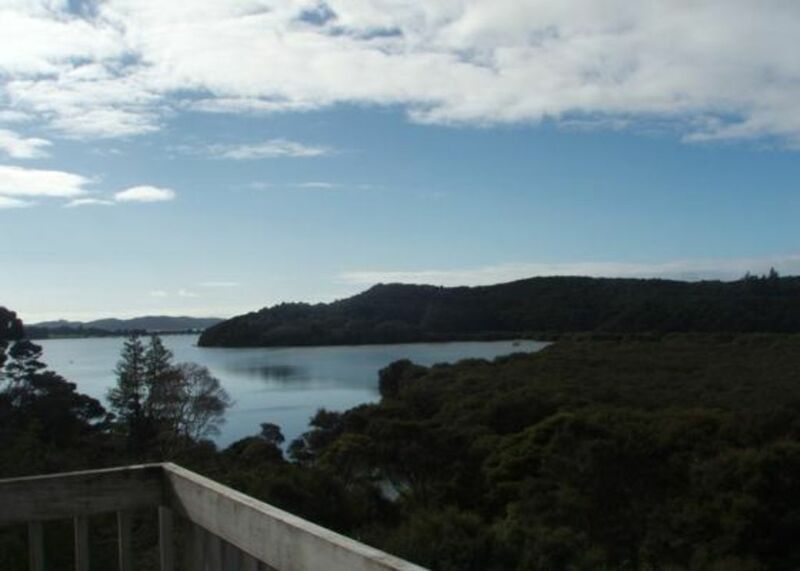 Set amongst native bush and situated right next to a scenic reserve, this 10 year old pole house offers beautiful sea views across the harbour to historic Waitangi. Tui Bach is sunny and comfortable, sit at the lounge bay window and watch the boats and kayakers go by. In high tide the water laps at the bottom of the section. Tui Bach offers peace and privacy and is home to many birds including tuis, quails and kiwis, yet it's only 3km from central Paihia and Beach. Bay of Islands offers numerous activities all year round. There is a large car deck, so there's room for two cars, or bring the boat! A lovely spot for a truely relaxing break away from it all. Price includes: fresh linen and towels. Free unlimited internet (WIFI) access. Downstairs is a spacious open plan lounge with flat screen TV and new kitchen with oven, dishwasher and microwave. A balcony leads off the lounge and looks over a scenic reserve with views of Waitangi. This level has one double bedroom and a bathroom with bath, shower, vanity andtoilet. The second level has the master bedroom, which has an ensuite and a private balcony overlooking the reserve. The house can accomodate up to 5 guests (two couples) as there are two double beds. The 3rd bedroom has a single bed. We charge $30 extra for a fifth guest. Smoking allowed outside only. Deck not suitable for small children. Fantastic place with ever changing views and everything you could need for a short or a long stay. Loved our time at Tui Bach. Paul has the house set up with everything you need. If we can get back to the Bay of Islands for a longer stay in the future we will definitely book again. We enjoyed a very relaxing stay at Tui Cottage which was enhanced by the spectacular views from the cottage over the Waitangi River. Sunrises were particularly spectacular. The cottage was well equipped and well presented and had everything we needed for our stay. Lovely bach, all amenities as detailed, felt right at home. Especially loved the window seat! Convenience store within easy walk, Paihia only few minutes drive. Would like to have stayed longer. Good to have message from owner checking all was ok on arrival. There were two couples in our group and all four of us competed for prime lounging spot on one of the two cushioned window seats with spectacular river views. We loved this property. The view from the window seat and the two terraces is superb. We felt as if we were living in a luxury tree house as the house is above tree level so we could enjoy watching and listening to the birds and spy on the kayakers in the bay. House is fully equipped and certainly surpassed our expectations. The house is close to Hururu Falls form where there is a really interesting 5km walk to the Waitangi Treaty grounds including a board walk through a mangrove swamp!